Visiting Florida, Trump Praises 'Incredible' First Responders, State Officials "It's a team like very few people have seen," Trump said of Florida and federal officials. 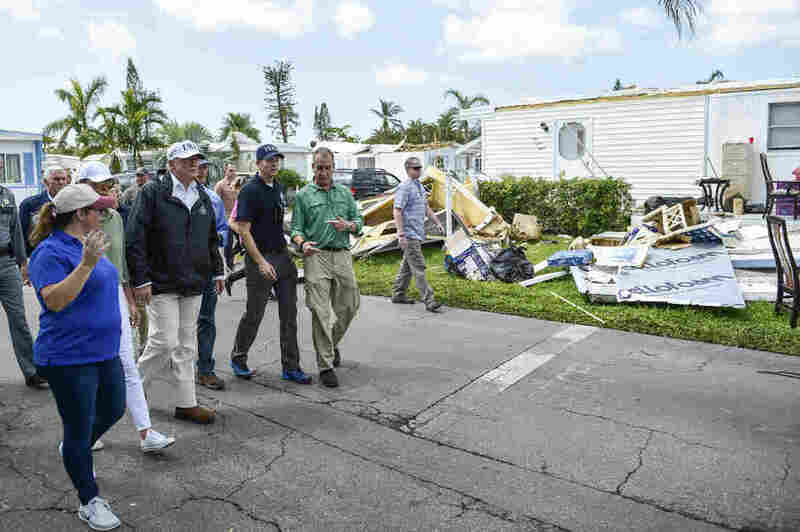 President Trump tours a neighborhood on Thursday in Naples, Fla., affected by Hurricane Irma. He spoke with at least one resident who was working to rebuild his house and served sandwiches. The surrounding area was littered with downed trees and ripped-out signs; mobile homes were totaled; and tarps covered roofs, according to pool reports. Gas stations along the way advertised that they didn't have fuel. Trump's praise, he said, is not just for rescue workers but "includes the people who live here. You see people immediately getting back to work to fix up their homes." Standing before rescue helicopters and personnel at a hangar earlier in the day in Fort Myers, Fla., Trump also heaped praise on the state and local officials standing with him. "It's a team like very few people have seen," Trump said, referring to Florida Gov. Rick Scott, Sen. Marco Rubio and state Attorney General Pam Bondi as well as FEMA Administrator Brock Long. "We're going to be there. ... We're with you today. We're going to be with you tomorrow," Trump said. Trump and Vice President Pence met with Scott and greeted rescue workers. The president also used the opportunity to encourage Scott to run for the Senate. "What do I know but I hope this man right here ... runs for the Senate," he said. Trump pledged to come back to Florida "numerous times." "We are there for you 100 percent," he said, adding, "this is a state that I know very well. ... These are special, special people and we love 'em."